- 10 % discount for all reservations made and paid until 01 Dec 2018! 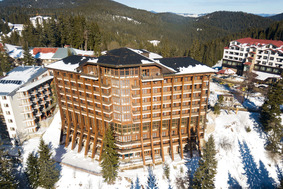 Hotel Orlovets is a modern 5 star hotel in Pamporovo, completed in 2005. Orlovets hotel offers an extensive range of facilities which include a sports centre with swimming pool and gym. After a long day on the slopes, why not enjoy a hot drink at the Panorama Bar which offers spectacular views over the Rhodope Mountains. Guests of the Hotel Orlovetz can also use the leisure facilities of the neighbouring Hotel Perelik which is connected by an undergroud tunnel. Location: The hotel is located in the centre of Pamporovo just 3 minutes walk from the ski bus stop. Facilities: balcony rooms available, fitness room, house bar, lift, lounge, massage (extra charge), reception, sauna, ski room, swimming pool. Wine & Dine: The hotel is offered on a half board basis with traditional and international cuisine served. Breakfast is hot and cold buffet style.